On the other side of the Black River, Holtyre is ten minutes east of Highway 11 on road 572. Like its cousin Ramore, Holtyre is a tiny three-street (Euclid, Gleason, Pearl) francophone hamlet. Dwight emailed me to tell me that Holtyre was built in the early 1930’s after gold was discovered. The town was named after 2 mines: Hollinger and Macintyre – hence the name Holtyre. The mine had high grade gold which was mined from 1935 to 1988 – over half a century. Up until the late 70s there were 2 stores, a large hotel, bowling ally, 2 schools (English and French – K to 8) and gas station. There was (and is) a larger school bus business that first started by transporting miners to the Johns Mansville Asbestos mine site between Holtyre and Matheson after WWII – the business evolved from there. Dwight also emailed to tell this story: supposedly in the mid-70’s the gold mine changed ownership and it was decided to save costs, close the smelter, and truck the raw ore to Timmins for smelting. Sounded logical, and for nearly 20 more years, this is what happened. In order to make room on the property, they decided to simply burn the old smelter building down – after all, it was over 40 years old and well used. The thing is, that inside of the structure had been in place since 1935 and was made of wood. Gold dust from the smelting process had been building in every crevice and crack in the old building. When they burned it down, there was enough pure gold that had melted into clumps on the ground, that when it was collected (as I understand in quite a surprising panic! ), the new owners paid for the mine – that day. It was clear profit from then on. Who would have guessed – certainly not the previous owners ! I noticed some interesting houses with two level front balconies, kind of like in New Orleans, but less extravagant. I wanted to take a photo, but Holtyre is so small that I felt oddly conspicuous and didn’t take any photos directly in town. (And hey, on my journeys I’ve been taking photos of everything and anything, so if I feel too out of place, then you know I felt weird!) I think it was because the community was just so small and was also off the road. I had no reason to be there, so it felt a bit weird. So instead, I took some shots of a local farm. The tiny photo doesn’t do it justice…it was such a great summer evening the first time I was in Holtyre. Holtyre has its own church, a playground, and an inordinate number of school buses. I think there is a school bus operator in town, but there were also old buses in a few fields and yards, so I wonder what’s up. I didn’t see any stores in town, but then again I skirted around and didn’t stop too long. I’m sure there’s a variety store. I don’t think there is a caisse or a gas station. There is an abattoir outside of town, if you happen to have any animals that need butchering. For more info, check out J. Charles Caty’s excellent history of Holtyre or the 25-minute documentary from 1971 on Holtyre that is online – you can watch it here, on Youtube. For an archive of the more than 450 comments (yes you read that correctly. More than four-hundred and fifty!) that were posted to Highway11.ca’s profile of Holtyre between 2008 and 2012, please click here. This entry was posted in Temiskaming and tagged farm town, francophone, mining by Highway11.ca Editor. Bookmark the permalink. Wow. Where is everyone? Nobody seems to be reading or writing anything on this site for a long time. Somebody besides myself must have some thoughts that could be put down. I come here once a week to see if any thing is new. So far nothing since Christmas. Don’t leave me out in the cold. Harry, I know what you mean. I have returned many times myself without seeing anything new posted. Everyone must have gravitated to facebook. merry christmas…this time of the year brings many memories of Holtyre as after I went off to boarding school in Montreal in 1954 , christmas was the one time I got home ( other than summer) until 1959.
we loss another oldtimer with the death of Peter Caylor this summer. past and present from our little town.. So sorry to read about Peter.Like all the Caylor family a fine person. Our sympathie to the family. Une partie de ma famille a vécu à Holtyre. Leur nom de famille était Lahaie. C’était dans les années 30-40-50-60 et 70. Je n’y suis allé qu’une fois dans toute ma vie. je me souviens très bien de la petite ville à 3 rues….Quel beau souvenir. Est-ce que quelqu’un connaît des Lahaie de Holtyre? Some of my family lived in Holtyre from the early 30`s til the end of the 70`s. I was there only once but I still remember the 3 street town. I remember it so well…..what a beautiful souvenir. Does anybody recall about the Lahaie family? My email address is pierre.desro@hotmail.ca Thanks in advance for providing any information that you feel is appropriate. Sad to see that town last time I was there a couple years ago. I loved growing up there. Curling, skating at the rink, hanging at the bowling alley, biking to the lake in Ramore in the summer. Knowing what time it was when Alice blew her whistle for the Lehman boys to come home. My partner Brian Egan (deceased) was Alice Lehman’s nephew. His Mom was Ruth Gleason. I visited there about 20 yrs. ago, stayed with Alice & Vernon & absolutely luved the friendliness of everyone. I am looking for some information re. Alice Lehman as I have some correspondence from her from a person who recently died and for whom I am the executor. Do you have any information re. her passing etc.? Looking to MOVE up to where there is NO ONE, really honestly we breed large dogs and want a place away from everything. We have our eyes on land right east of here, any info or advice appreciated! Enjoy reading all the comments on the past site and the new one. I am Casey one of the children of Alec (Wavell) and Geneva (nee Scott of Holtyre) Akulick. I did recognize many of the names on this page and it does bring back many memories of stories told by mother and her sister of growing up in Holtyre. All the best to everyone for the New Year. Hi casey. How you doing? still in the big smoke? Hope you haven’t run into any moose with your motorcycle for a while. Hope everything is going good for you. Still driving in the mad rush everyday with all of the other lemmings. I have not been on a motorcycle in about twenty years now I figure. Still own them though. Everything is fine down here. How have you been doing? I hope you are keeping well. best for 2014 to everyone connected to the best little town HOLTYRE. Time to wish everyone all the best for a Very Merry Christmas and a verry very Happy New YEAR. Hope to see some of you in Holtyre this summer. H.
We lived in Holtyre in 1966. My siblings are in the class pic. 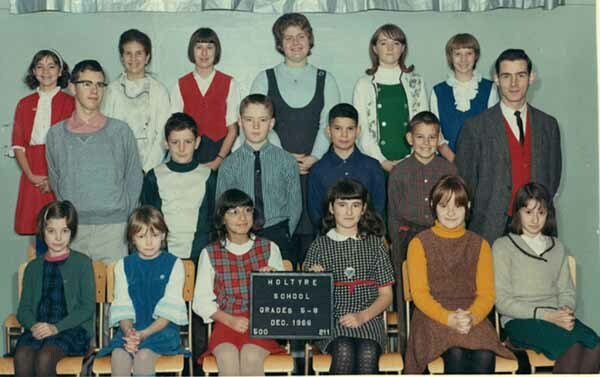 David Gagnon, Grade 5, middle row wearing plaid shirt, beside the teacher. Ken Gagnon, Grade 3, 3rd in the back row wearing the maroon shirt. Colleen Gagnon front row wearing the blue jumper with black tights. I will pass along this site for them all to see. I am the youngest so wasn’t in school yet. Anyone remember my parents ~ Keith and Gladys Gagnon? I lived in Holtyre for awhile I believe from 1961-65. I went to the public school there from grade 1-4, then we moved to the Kirkland Lake area. I remember in, I believe, 1964, the school did a time capsule. Does anyone know what happened to it? Our family name was Aldred, Jim and Betsy (parents). I remember a Theresa, I believe Messier. Laureen and Maureen were twins with a brother, Randy, who could wiggle his ears. I don’t remember their last names. The telephone operator was Phinon (something like that). Granny’s Restaurant. I remember random first names but that doesn’t help to locate people at all. The family with the twin girls were the Peters family. Keith Gagnon is my half brother, where are Kenny and David and Colleen now? Happy thanksgiving to everyone, have a safe holiday weekend…. Had a great time hunting and fishing up home at the start of bird season. What a good time . Stayed at Perry Lake with Bud Hart and a friend of his from the States. We got. No they got some fish. I couldn’t buy one but did manage to get some birds. Bud”s friend got a nice bear. So out trip was a lot of fun. If any of you are looking for a nice place to stay, try The Little Fox Lodge at Perry Lake . It was a good place to stay. Nice and warm. Clean cottages. Brother John and I stayed there during the reunion. Hope everyone is keeping well . Hello Patrick, It was really good to read your posting and to know that you are doing well despite all that you have been through recently. I hope that you do make it up to Holtyre (a long way from Washington State) and if you do, please let everyone know so that we can come up there to say “hello”. Wishing you well! John and all who were friends of the Tracy Family 1959-61. I,m sorry that my older brother Mike and I could not be at the reunion. Mike was extremely ill and passed away before we could complete our plans to attend. I would like to tell you all that Holtyre and all of you were on our hearts when ever we had an opportunity to visit each other over the years. I miss him dearly as I do all of you there. Shortly after his passing I fell ill to two bouts of Pancreatitis and almost died. They discovered Kidney cancer shortly there after and my right kidney was removed. All is well at the present and somehow before God takes me, I hope to make the trip to Holtyre for he and I, both. I’ve recovered well and am able to move around like always. We heat with wood here and I still swing an axe. Not too bad for 63yrs. ( Ha Ha soft American) I sincerely hope this finds you all well and maybe I’ll get the opportunity to come and smell the cool fresh air that was always a part of our memories. As a Minister I send you all my love and will always keep you in my prayers. Nice to see the school photos. I am in the Grades 1-4 class. Back row – fourth from the right end (red dress) My sister Lucy is in the other photo second from the left in the front row (blue dress). Our family left Holtyre in 1970 after our house burned down. It was on the corner beside Durocher’s. That must have been Bybergs house??? So nice to see this site back missed hearing from everybody . 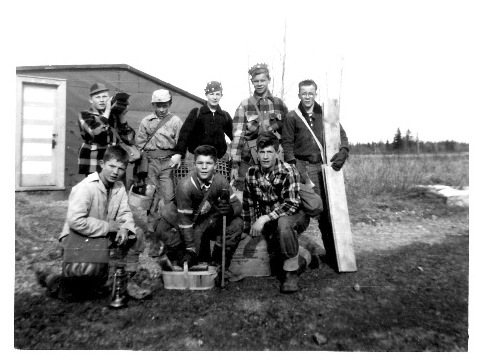 Hi, The unidentified boy in the “camp” picture…second row from the left is Gordon Coulis. Bernice his sister email me to confirm it was him. Does anyone know the email for the editor? I have some more interesting pictures such as the VE parade from 1945 & a few others which I would like to send him. The picture of the boys is taken in the spring of 1953 and is behind our house [manager's house] & in front of our old chicken coop. The boys are back row left to right: Billy Elliot; unknown; Jimmy Caylor; Charlie Caty [then known as Charlot] & Terry Draves. Front row left to right: Johnny Zeamel; Wayne Totten & Leo LeClair. The cabin was west of the mine on a trail to the Elie farm which was east of the St Onge Road. I sure was happy to see the site up again!! Also, the picture of the boys–one in front, is my brother Wayne. Almost a year has passed since we had our reunion. Time sure does fly. Days are longer but the years are shorter. I was just thinking back to the reunion and hope that everyone is looking forward to the next one. Hope that you are all well. wonder if there will be another one, would be nice if their is. Maybe a little later in the summer like the August long weekend.. Yes Harry Another reunion would be great ! Maybe just a casual get together. The organisers of the last one did a great job. There could never be another like it. I love to read the comments! I am hoping to bring my three grandkids from Timmins on a picnic at Monroe Lake where my mom and dad jused to bring us after my dad’s shift at 4 o’clock. In the comments about the schools in Holtyre the french school had at one time up to grade 10. I did up to grade 9 there and that year there was no more grade 10. This summer I’m hoping to bring my 3 grandkids from Timmins, on a picnic at Monroe Lake, where my mom and dad used to bring us after my dad’s shift at 4 o’clock. Agnes maybe it could be while you are there. it would be hard for the town to get back on track with everything being stripped away. I hope people fight this, i would also get the people who own the mine to get involved. On the lighter side the holtyre fire departments record is second to none, they never lost a lot…. Hope to get up home the first week of June to do some fishing. Hope that the water is down by then.Got a few creeks that I would like to get into that I haven’t fished for many many years. Hope they stll have some nice trout in them. I am writing on behalf of my grandfather William (Bill) Delves. He was born in 1932 in Cobalt. He just turned 80 in November 2012. He lived in Ramore from 1934 to 1949. His dad George Delves born 1900 who worked the OPP in Cochrane and owned the Ramore hotel along with his wife Ruby Delves nee Mahon, almost the whole time they lived there. A huge fire started in the general store and burned the hotel to the ground. He rebuilt the hotel on another street. His brother Harold Delves born 1933 or 1934 was one of the children that drowned in the August 1946 Maude Lake accident where several other children and Alphonse Bouchard who was a miner and a farmer, took the kids for boat rides. Only three of the children survived the accident as the majority of them could not swim. My grandfather and several of his family witnessed the drownings first hand. There were plane rides given and my grandfather and his brother Kenny were on the plane when the boat overturned. The pilot landed the plane and told them to get off to help in a rescue effort. The plane hit the water and all the rivets came loose. The plane was then towed to shore and tied to a free and sunk over night while the children’s bodies were being pulled in to shore. My grandpa witnessed his deceased brother being pulled in. The Delves family were, George Delves (father) Ruby Delves (mother) Kenny Delves (brother) Jack Delves (brother) Bernie Delves (brother) William Delves (my grandpa) Harold Delves ( brother, deceased that day at Maude Lake) Margaret (Margie) Delves (sister) Robert Delves (brother) Terrance Delves (brother) Darlene Delves (sister deceased 1950 blue baby). Jack married Aline Robitaille from Ramore. If anyone has any other information, or would like to discuss or comment, please reply! Thank you! Hip!Hip! Hurrah! We’re back on the map! Does anyone have plans to travel up to Holtyre this coming summer? I had a billing error that caused the webhost to delete the whole site about a month ago. This seemed like a good opportunity get out of the dark ages and modernize the site. When I first put in the ability to comment on pages, back in 2008, I never thought anyone would use it…I didn’t realize that many people had seen the web site! I’d like to thank everyone for their contributions, past and present, for putting up with all of that spam on the old site! FYI – comment now are organized with the newest ones at the top, and oldest at the bottom. I’m so glad that you decided that this website deserved further attention! The old site was such a joy to read and contribute to! Now we can do so without all the awful spam. Thank you! The picture of Terry Draves and his gang was taken, I believe, in the mid 50′s. Can anyone put names on the rest of the group? Hi, nice to have this site back. Looking forward to reading everyone’s comments. I agree it is good to,have this site again like reading all the comments from people i grew up with. Good to have this site again. Sure is good to be back on our sight. Many thanks to Mark.Sure was good of you.If I ever get to meet you beers on me. Welcome back! We were worried when we couldn’t find you for a while.